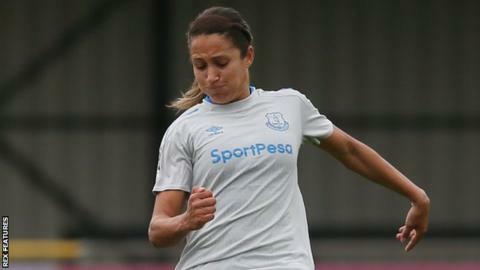 Everton Ladies climbed to sixth in Women's Super League One with a comfortable home win over Sunderland. It was the only WSL 1 match played on Sunday as four other games were postponed because of wintry conditions. Chaney Boye-Hlorkah's angled shot and two close-range finishes from Courtney Sweetman-Kirk gave Everton a 3-0 lead. Danielle Turner netted from the left touchline and added her second from 15 yards, before Bridget Galloway turned in a set-piece to reply for Sunderland. Everton had started the game second from bottom of the table, but took advantage of other sides' inactivity to rise three places and above opponents Sunderland on goal difference. You can now add WSL 1 notifications for line-ups, goals, kick-off, half-time and results in the BBC Sport app. Visit this page to find out how to sign up. Match ends, Everton Ladies 5, Sunderland Ladies 1. Second Half ends, Everton Ladies 5, Sunderland Ladies 1. Goal! Everton Ladies 5, Sunderland Ladies 1. Bridget Galloway (Sunderland Ladies) right footed shot from the right side of the six yard box to the bottom left corner. Assisted by Lucy Staniforth with a cross following a set piece situation. Foul by Jodie Brett (Everton Ladies). Danielle Brown (Sunderland Ladies) wins a free kick on the left wing. Goal! Everton Ladies 5, Sunderland Ladies 0. Danielle Turner (Everton Ladies) right footed shot from the centre of the box to the bottom right corner. Assisted by Georgia Brougham. Attempt blocked. Zaneta Wyne (Sunderland Ladies) left footed shot from the centre of the box is blocked. Assisted by Keira Ramshaw. Attempt blocked. Dominique Bruinenberg (Sunderland Ladies) left footed shot from outside the box is blocked. Attempt blocked. Ellie Stewart (Sunderland Ladies) header from the centre of the box is blocked. Assisted by Lucy Staniforth with a cross. Corner, Sunderland Ladies. Conceded by Siri Worm. Foul by Siri Worm (Everton Ladies). Lucy Staniforth (Sunderland Ladies) wins a free kick on the right wing. Attempt missed. Lucy Staniforth (Sunderland Ladies) right footed shot from more than 35 yards misses to the left from a direct free kick. Foul by Angharad James (Everton Ladies). Lucy Staniforth (Sunderland Ladies) wins a free kick in the attacking half. Attempt missed. Lucy Staniforth (Sunderland Ladies) right footed shot from outside the box is close, but misses to the left. Assisted by Kasia Lipka. Georgia Brougham (Everton Ladies) wins a free kick in the defensive half. Foul by Keira Ramshaw (Sunderland Ladies). Offside, Sunderland Ladies. Lucy Staniforth tries a through ball, but Bridget Galloway is caught offside. Corner, Sunderland Ladies. Conceded by Angharad James. Attempt blocked. Lucy Staniforth (Sunderland Ladies) right footed shot from outside the box is blocked. Assisted by Zaneta Wyne with a headed pass. Offside, Everton Ladies. Marthe Munsterman tries a through ball, but Mollie Green is caught offside. Substitution, Everton Ladies. Mollie Green replaces Courtney Sweetman-Kirk. Substitution, Sunderland Ladies. Danielle Brown replaces Hayley Sharp. Substitution, Everton Ladies. Olivia Chance replaces Chantelle Boye-Hlorkah. Substitution, Everton Ladies. Marthe Munsterman replaces Simone Magill. Delay in match Hayley Sharp (Sunderland Ladies) because of an injury. Jodie Brett (Everton Ladies) hits the left post with a right footed shot from outside the box. Assisted by Simone Magill. Courtney Sweetman-Kirk (Everton Ladies) wins a free kick in the attacking half. Foul by Kasia Lipka (Sunderland Ladies). Attempt saved. Keira Ramshaw (Sunderland Ladies) right footed shot from outside the box is saved in the bottom right corner. Attempt missed. Danielle Turner (Everton Ladies) left footed shot from outside the box misses to the right. Assisted by Chantelle Boye-Hlorkah. Attempt saved. Ellie Stewart (Sunderland Ladies) right footed shot from more than 35 yards is saved in the centre of the goal. Assisted by Victoria Williams. Offside, Everton Ladies. Siri Worm tries a through ball, but Courtney Sweetman-Kirk is caught offside. Goal! Everton Ladies 4, Sunderland Ladies 0. Danielle Turner (Everton Ladies) left footed shot from a difficult angle and long range on the left to the top right corner. Assisted by Simone Magill. Foul by Chantelle Boye-Hlorkah (Everton Ladies). Zaneta Wyne (Sunderland Ladies) wins a free kick in the defensive half.